The Tioga Road (Highway 120) climbs above the Valley, transporting you to breathtaking views and pristine lakes. After sweeping across enchanting Tuolumne Meadows, it cuts through the mountains at Tioga Pass. The biggest question of the year in Yosemite is always “When will Tioga Pass Open?” This can be difficult to answer as it it typically based on how much snow has fallen the previous winter over the pass. Check here to see the plowing update for this season. This is the high country, nearly inaccessible in winter, when heavy snows blanket the road and freeze the rivers. In the spring and summer months, winter melts away and the meadows bloom. The waters of Tenaya Lake and the Tuolumne River soak up the heat of the sun, inviting you to swim, fish, and hike along their banks. Spot flowering purple lupine and bright yellow monkey’s paw and slide otter-like through river rapids in Tuolumne Meadows. Lay out on sun-warmed granite slabs, or get your heart rate up scaling Lembert Dome. On your way up the Tioga Road, pull over at the Olmsted Point overlook to see the Valley laid out beneath your feet. Splash in the Tuolumne River or dip into Dog, Tenaya, and May lakes. Away from the bustle of the Valley, wildlife makes frequent appearances on the shore. The high country also offer exceptional hiking trails. 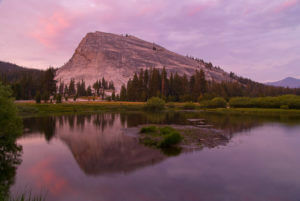 The High Sierra Camps, accessible from Tuolumne Meadows, are a favorite with backpackers. From the Valley, take Hwy 120 towards Big Oak Flat Road and turn off at Tioga Road (Hwy 120 East). Follow the Tioga Road to Tenaya Lake and Tuolumne Meadows. When the Tioga Road is closed, alternate routes are available to get to various destinations. Travel north on US 395 to Minden; take Highway 757 west to Highway 206 south to Highway 207 north to US 50 west. Take Highway 190 west to US 395; take US 395 south to its junction with Highway 14. Take Highway 14 south to Mojave. In Mojave, take Highway 58 to Bakersfield. From Bakersfield, head north on Highway 99 to Fresno. In Fresno, take Highway 41 north into Yosemite National Park. Take I-15 west to Barstow; Highway 58 west to Bakersfield; take Highway 99 north to Fresno. In Fresno, take Highway 41 north into Yosemite National Park. Take I-80 or I-50 west to Sacramento; take Highway 99 south to Highway 120 east (Manteca) or Highway 140 east (Merced) into Yosemite National Park.